Unleash your sensuality and empower your girlfriends as well! 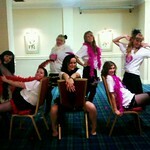 Take burlesque dancing lessons and learn the basic moves in two hours. Burlesque dancing is more than just a dance; it’s freedom for your body. Crush your inhibitions and express yourself. It’s playful, expressive, and a really feminine way to bond with your ladies. Unveil the inner bombshell in you! Let this liberating dance enhance your self-confidence, improve your posture, shape up your body and bond with your girlfriends in a fun, sensual way for two hours. You will have the whole burlesque ensemble with you and the group dressing up as showgirls with the corsets and high heels. So have fun, learn from the expert, and dance with style and confidence! Why Go For Burlesque Dancing Lessons? Burlesque ensemble for an genuine experience: Corset and high heels for you!